The syringa plant, better known as a lilac bush, has been a favorite shrub of homeowners and landscapers for eons, and for good reasons. In the spring, it becomes densely covered with colorful blooms, and they smell like a slice of heaven. Not many flowers are as heavily perfumed as lilacs. The proper name is syringa (pronounced si-RING-uh), and there are varieties to suit nearly every taste and growing condition. There are numerous colors of blooming lilacs available, from white to pale yellow to lavender to the deep, intense hot pink hues of the Redwine Syringa Plant. The Redwine also has a slightly spicier scent than most other lilacs. The Bloomerang® Purple Syringa Plant is unique in that it blooms like most varieties in the early spring, but then it re-blooms after the summer begins to turn to fall. It has a mounding habit, full green foliage throughout the warm months, and two seasons of luscious deep lavender flowers in abundance. In a full sun to mostly sunny location, the Bloomerang® Purple Syringa will grow 4 to 6 feet tall. It has normal watering requirements, and will thrive in most soil types. It's a very low-maintenance shrub that will even grow well in a container. Syringa plants create an intoxicating fragrance outdoors, and the cut flowers will scent a whole home interior when used in arrangements for centerpieces or placed in bud vases. Syringas produce plenty of blooms, providing you all the cut flowers you need without diminishing the beauty of the shrub. Just make sure to clip them with high quality bypass pruners, so you don't crush the stems and prohibit healthy future growth. Also, dead-heading the spent blooms will increase flowering production the following spring. Lilacs can become leggy, so it's a good idea to prune branches back at the end of the growing season. They'll come back bushier and with a more balanced shape and healthier foliage and flowers. If you like plants that have a graceful weeping habit, the Lilac Sunday Syringa Plant is a lovely shrub. It has an unusual stem design, with flowers produced both on the stem tips, called panacles, and also laterally growing buds farther down the stems. The weight of all the flower clusters causes the branches to grow downward instead of upward, giving this unique lilac a very flowing shape. When planning landscaping, it's a good idea to consider the best seasons of your plants, and try to achieve year-round beauty in your spaces, no matter what your growing climate. Lilacs are a welcome sign of spring in most regions, and they continue to provide full foliage throughout the summer, for hedge rows or single focal-point planting. 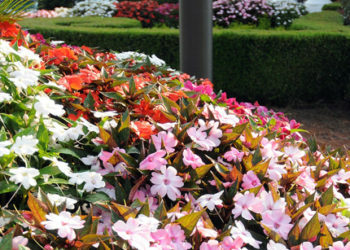 Have You Met Our SunPatiens Impatiens? What is the Ideal Soil Temperature for Sowing Vegetable Seeds?